In this timeless classic, the Peanuts gang faces the serious sickness of a good friend with all the sensitivity, caring, and warmth that is the trademark of Charles Schultz's work. Why, Charlie Brown, Why? is a heartwarming story of a child dealing with great challenges and profound questions. 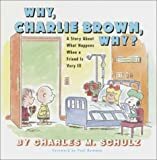 When young Janice is diagnosed with leukemia, Charlie Brown looks for answers, Linus becomes her protector, Lucy doesn't understand, Snoopy dons his '"World's Greatest Surgeon" togs, and the whole gang does some soul searching. In his own inimitable style, Charles Schulz brings this touching tale to life. With charm and compassion, he tells of the effect of Janice's illness on her family, her classmates, and, of course, her friends.